Small but beautifully formed, some of it by the Romans, Fréjus is well located for the French Riviera and the Côte d'Azur, and has some charming attractions and busy regular Wednesday and Saturday markets. Some of the best places to stay in Fréjus are within the small town, but if you’re looking for peace and a chance to escape then you might find some of the best hotels just out of town in the foothills of the Estérel Massif mountains, or towards Saint-Raphaël and the coast. Considering the size of the town, the grand Gothic cathedral seems a little out of place, but charmingly so, and the amazingly fanciful medieval frescoes inside are definitely one of a kind. Fréjus has a chapel decorated by artist and filmmaker Jean Cocteau. The port is still quite large and there are plenty of nice, sandy beaches close to the town, plus there’s also a large water park, the Parc Aquatica - ideal for a family day out. There are plenty of great places to go for a stroll - many with exceptional views of the sea or the mountains. Don't forget that the town will be very busy during the peak summer months. So if you want to ensure a room in one of the best places to stay in Frejus, do yourself a favour and book well ahead. The Hotel L’Arena is a comfortable, rustic, Provencale hotel with 32 room which overlook beautiful landscaped gardens and an inviting pool terrace. The beach is about a mile away, but you’re in the heart of Fréjus. La Villa Mauresque is a Neo-Moorish villa blessed with panoramic views of the Cote d’Azur. There are 17 individually designed rooms decorated in neutral tones but with splashes of bright colour. Some have their own jacuzzis. La Bastide du Clos des Roses is a peaceful, eight room hotel surrounded by vineyards. You’re in the foothills of the Estérel Massif mountains so the views are green and serene in every direction, plus there’s a lovely pool and a fragrant rose garden. Romantic, relaxing and gourmet. If you'd prefer a self-catering option this holiday - don't hesitate to visit our online partner, Booking.com for a great selection of properties, ideally located for making the most of the town and the coast. Fly to Nice Côte d'Azur International Airport located 58km (36 miles) from Frejus with a wide selection of flights to destinations across Europe along with further afield including to the U.S.
Alternatively, catch a train to Frejus with rail links to Toulon and Nice. If you want to rent a car to explore the stunning coast, for prices and online booking click here. Best time to visit - the summer from June to August for hot, sunny weather - ideal for exploring the sights or unwinding on the beach. L'Arena hotel's rooms boast warm summer colours and true Provencal rustic styles in a comfortably modern setting. Each looks out over the beautifully landscaped gardens, or the inviting pool terrace area. Explore locally - Fréjus dates back centuries, or head to the beach a little over a mile away. 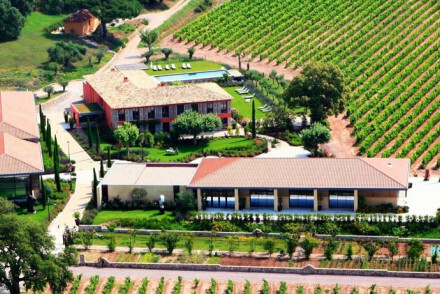 A peaceful hotel surrounded by vineyards, in the foothills of the Estérel Massif mountains. Chic rooms are minimalist yet comfortable. Enjoy some relaxation by the pool or wander through the fragrant rose garden. Do not leave without sampling some fruits from the vine! Romantic Break - Wine tasting, gourmet dining in bucolic France - tres bon! Great walks - Great walking opportunities in the Esterel Massif mountain range. Local markets - Explore local markets in Frejus.